Corozal is rich in arts and crafts. 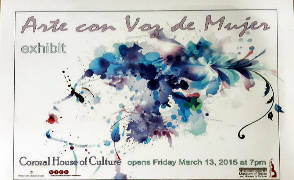 The fifth annual Arte con Voz de Mujer exhibit opened at the Corozal House of Culture on March 13, 2015. It featured nationally known Corozaleña Vilma Romero. This page shows her work and some by other artists. Printed from https://corozal.com — Art and Crafts in Corozal.